At the beginning of this year, at the first meeting I ran as President, we laid out our intention to influence a wide range of elections. We decided to push our normal scope, work with more community groups, and elect more progressive Democrats. We pushed ourselves by petitioning in the cold, in the rain, and then through the overwhelmingly hot summer. We endorsed more candidates this year than I can remember us doing as a club. We pushed ourselves to understand and learn more about Congressional districts, Senate districts, and judgeships. We worked with more community groups than I can remember. We held petitioning trainings with Persist 81, we helped Indivisible Nation Bk collect letter signatures, we worked with runNYC, WHARR, GOBK By Day, and many other GetOrganized Bk working groups. 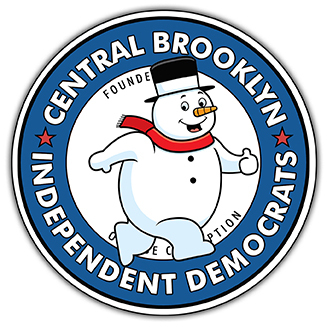 We canvassed with IND, NKD, BYD, BRD, LID, ESPA, SCDC, and others from around Brooklyn on our common goals. One thing is clear -- when we work together, we win. When we support local organizers, we win. When we get out of our bubbles and push ourselves, we win. As we move into 2019, we have a long, long list of issues we want to focus on. This list was generated by you, by club members, and will be driven and grown by you. And if you don't see anything listed below that you want to get involved in -- then just let me know! And we'll get you in charge of that issue and all the resources you need. 2019 is going to be a big year of getting these promises fulfilled from the electeds who we helped get into office. We need the energy of this past year to keep going and focus on getting the changes we desperately need in New York. Thank you all for all your work, and I look forward to working with you as we march forward. If you have not paid your dues for 2018, you may pay your dues on or before the December 18th Public Advocate forum and your membership will be "cured" and you will be able to participate in the Publlic Advocate Endorsement vote. Additionally, if you pay in the last 3 months of 2018, your 2019 membership will be considered to have been paid as well. If you wait until January to pay dues, that will be 2019 dues, and if you weren't a paid member in 2018 you will be considered to have rejoined and will not be able to vote on endorsements or club leadership until 60 days from the date you rejoin. We will be holding our Public Advocate endorsement meeting immediately after the forum. Please see Allison Mingus or Alice Ott for a ballot. If there is a committee that you would like to see but is not listed above you can email Asher at ashercbid@gmail.com with suggestions. At CBID's Annual January Meeting we will be holding elections for our Club Officers and At-Large Executive Committee Members. The executive committee serves "as the administrative and governing body of the Club" and meets once a month, usually on the Monday after the general meeting. Every position is a one year term with the President of the club being limited to no more then two one-year terms. All candidates for election must be members in good standing as of sixty (60) days preceding the election. The number of Executive Committee members is equal to 10% of the members which will be determined as of the January meeting. This year there will be several openings on the executive committee, and we encourage you to run for any of the officer positions if that interests you. If you are interested in any of these positions please email ericacbid@gmail.com to be included on the candidate list that will be sent out in January. Nominations from the floor will also be taken at the January meeting for Executive Committee positions only.